Thanks to click-together flooring, it's easier than ever for homeowners to put engineered hardwood underfoot. As with so many other do-it-yourself jobs, careful planning is the key to pro-quality results. Over the last decade, engineered wood flooring has developed by leaps and bounds, making it more affordable than ever before for homeowners to put hardwood underfoot. That’s partly due to the fact that engineered floorboards are so friendly to do-it-yourself installation. Click-together flooring products are the simplest of all, requiring neither glue nor nails. The tongue-and-groove design allows boards simply to click together and float, so to speak, over the subfloor. Even a relatively experienced DIYer can install click flooring using basic tools and a handful of inexpensive, readily available supplies. Read on to learn how it’s done. Like solid wood flooring, engineered wood products are sensitive to moisture, alternately shrinking and expanding as temperatures and humidity levels fluctuate. Therefore, the first step in installing click flooring is to bring in the boards, remove any packaging, and give your purchased flooring time to acclimate to the conditions of your space. A period between one and five days normally suffices. 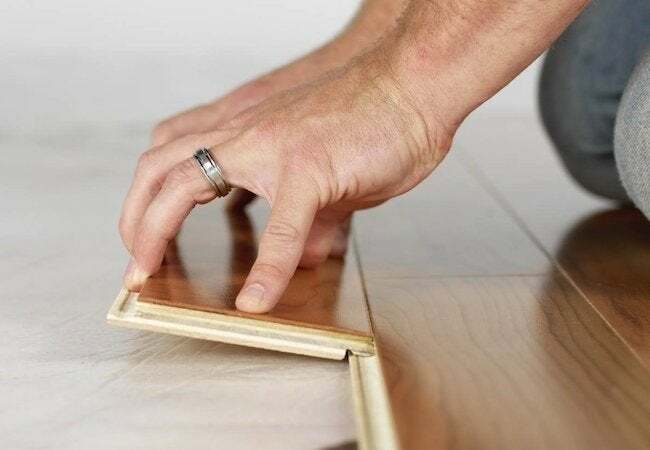 It may be somewhat of a drag, but exercising patience here is the best thing you can do to ensure that the floorboards do not separate or cup over time. No matter the material of the subfloor, test its moisture content by means of a moisture meter to confirm that it’s not above 12 percent. Next, use a level to make sure the subfloor lies, if not perfectly flat, then within a 1/8-inch incline over any given six-foot radius. Make any adjustments necessary before moving on to lay down the moisture barrier and/or underlayment recommended by the manufacturer. Now is the time to plan your installation strategy. 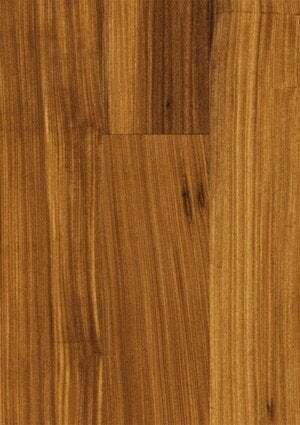 Best practice is to install floorboards so that they run parallel to the longest dimension in the room. You may wish to dry-fit at least some of the material as a way of proving not only that your strategy is going to work, but also that you have enough flooring to get the job done. Before you proceed any further, inspect all planks for damage and defects. As you prepare to install the first course of floorboards, remove some planks from at least three different boxes (typically, engineered products are boxed by length). Lay out a line of boards in random sequence, then grab the first board and place it in the corner, with the grooved side facing away from the wall. Place expansion spacers between the wall and the board edges that meet the wall. Repeat the process with additional floorboards, running them along the wall and locking together the short ends of any boards that meet (although a full lock isn’t possible until you put down the second row). It’s very likely that you’ll need to cut the last plank to size. Measure the distance from the wall to the leading edge of the penultimate plank, then cut the final floorboard to that length, leaving a little room for the spacer. Now install the second row. To keep the joints between the rows from lining up, start this second run with a board whose end hits at least six inches away from the nearest joint in the initial row. Remember to place a spacer between that first board and the wall. Then slip the long tongue of this first board into the groove on the first row of flooring. To guarantee a secure connection between boards, be careful to keep dirt and debris out of the grooves. Continue installing floorboards over the surface area of the room until you come to the last row. Here, you may find that the space remaining is not wide enough to accommodate a full board. In that case, measure what space is available, then rip as many boards as necessary down to the appropriate width. If you encounter a clearance issue that prevents you from locking any of these last boards against the groove of the adjacent second-to-last row, simply do this: Using a utility knife, plane the tongue off the edge of the boards that would not fit otherwise, then affix them in position by means of wood glue. Remove the spacers from the perimeter of the room, and in the gap those spacers were occupying, install transition moldings directly to the subfloor. Quarter-round or baseboard moldings, installed against the wall, are also recommended (but not strictly necessary). Finally, clean the floor per the manufacturer’s guidelines and replace all furniture in the room. And you might want to put felt protectors on the legs of any chairs to protect your beautiful new floor! It depends on the size of the room, of course, but in most cases it’s eminently possible to install a click floor within a single weekend. With proper planning, you can begin the project on Saturday and be done in time to host friends for a get-together on Sunday evening. They would never guess that you did it all yourself!